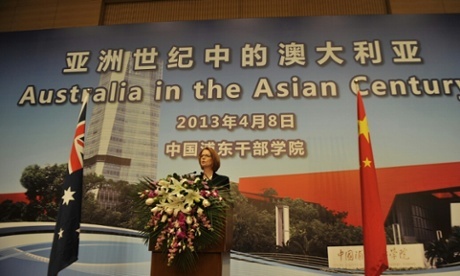 Australia looking to shift its sights – how to milk rising China’s next phase of growth. By becoming a confluence of China’s booming middle class hierarchy of needs, perhaps? The Aussies have taken big steps to show the world it is possible to grow up and smell the roses. There is good business to be done and they know how to do it. The White Australia policy is still in recent memory yet the Chinese have been here since the gold rush days in the 1800s. Nevertheless for some perspective – Chinese make up 4% of the Australian population in one of the planet’s sparsest spaces with 2.8 people per km/2. Fast forward 2013, Australia is smart enough to manage both the US and China without greatly offending the other – yet milking both abundant strategic and economic reward from both. Recent news from China and America has caused some panic around the world and should reinforce the view that the Australian economy of the early 2000s will not come back, regardless of who is in power after 14 September. The tremors started in America and flowed to China, and in some ways the news out of both was the same. In essence it boiled down to both nations saying that the government could not carry the economy forever. The chairman of the Federal Reserve, Ben Bernanke, let it be known that if the US economy improves and if the unemployment rate goes below 7% it will start to think about easing its monetary policy by cutting back on buying $85bn worth of bonds each month. He also noted that later the Federal Reserve might think about raising interest rates. Much later – like perhaps two years’ time! That such news resulted in the US dollar appreciating against all currencies gives you an indicator of how skittish markets can be. This was an announcement of things that might happen if things keep going well. So you can imagine how edgy they would get when news comes out about things happening now – bad things. And this brings us to China. Please click here to read the entire article at the Guardian. 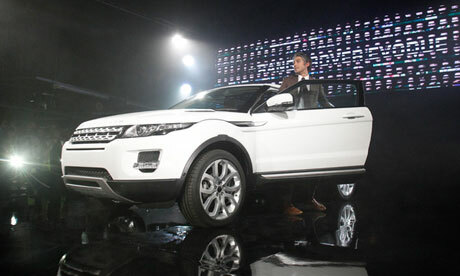 Guardian: JLR and Chery ramping up for China’s middle class boom? The Guardian’s industrial editor provides details as the famed UK off-road powerhouse now join European counterparts Audi, BMW and Mercedes-Benz with full-blown local production capability direct in the world’s biggest auto market. Quite a few of my mainland Chinese peers who now live in Australia love the Land Rover aesthetic. Most do not push (yet) their stately steel horses to the brink, preferring to drive them inland and keeping them spotty clean but I digress. “China is now our biggest market,” Ralf Speth, chief executive officer of Jaguar Land Rover at press briefing announcing their 10.9b yuan eastern China plant in their 65th year of operations. The plant will also see an R&D component. Jaguar Land Rover has signalled the importance of China to its growth prospects by starting the construction of a factory outside Shanghai. JLR and its Chinese partner, Chery, formally laid the foundation stone for a plant in Changshu, near Shanghai, as part of a 10.9bn yuan (£1.1bn) investment that will include a new research centre and an engine production facility. The firm’s owners, Tata, also own a JLR assembly plant in India but the Chinese venture is the company’s first full-blown sortie into overseas manufacturing, reflecting stellar growth in the car firm’s third largest market. Viewed from the snow-covered hills of Tangwanghe, the forests of China’s Great Green Wall seem to stretch out endlessly towards the horizon. The man-made ecological barrier is designed to halt sand and dust storms, just as the original 2,500-year-old Great Wall was built to keep out the Mongol hordes. A happy new year everyone, good travels and remember the key, is to breathe deep. It has been a recurring problem for the longest time, impositions. As much as the West has been unable to see things in context, it looks like China might just grow to be equally narrow-minded if it is not careful. The middle path, and respect is the key. What is becoming ever more clear as this year rattles to an end is that the west has no idea how to handle China. Since the relationship of the People’s Republic will be a key factor in the year (and many more years) ahead, that makes this a core question for the Obama administration and Europe – and, closer to the mainland, for India and Japan as well. But there still seems to be an almost childish reluctance in the west to accept China for what it is, whatever one may think of what it is. It might be nice if China was more like us, but it isn’t going to be. Expecting it to fit into the paradigm set by the west is not only futile but positively dangerous. The sooner governments start to work out a meaningful China policy rather than depending on wishful thinking, the better. It would make a good New year’s resolution. But I’m not holding my breath. Then we had the spectacle of Obama’s visit to China, during which his “town hall” meeting in Shanghai was transmitted only by one local television station, and during which the Chinese arranged a programme for him that was heavy on tourism. Yes, it ended with a lengthy list of general agreements to co-operate and assurances that the basis was being laid for long-term relationship. But the beef was missing, and US briefings that the two sides had reached meaningful agreement on climate change were swiftly blown apart by the fiasco of Copenhagen. Mark Lynas’s much-remarked piece in the Guardian puts the blame squarely on Beijing, but takes no account of how the Chinese system actually operates, seemingly imagining it runs on western lines. The Chinese position would have been set out in advance and approved by the standing committee of the politburo. Wen could not deviate from that, even if he had been minded to do so. He may be prime minister but he ranks third in the standing committee and moves carefully. On such a crucial issue, he would be able to do absolutely nothing that might be seen as jeopardising the domestic economy; China accords importance to the environment but a good deal more to growth. In addition, several key Chinese leaders were out of Beijing at the time and this is a leadership that likes to have everybody in the room when decisions are made and doesn’t believe in long-range teleconferences. So it is safe to assume that China was not in negotiating mode, and that, unless Beijing was being set up as the fall guy, Obama, Brown, Miliband et al should have know this, and negotiated accordingly. The same goes for the currency, human rights and, unfortunately for him, for Shaikh. It is also likely to be the case if trade disputes swell next year, as one must anticipate. All that is a recipe for caution. Not for the kind of reasoned flexibility and give-and-take which the west likes to make the basis for relationships between nations (however fallible this proves in practice). Repeating mantras about the need to revalue the yuan, respect human rights, join in independent monitoring or accept emission targets which would threaten the growth that provides the regime’s prime legitimacy may be necessary for the west’s own self-respect and defence of its own values. But the chances of getting results is razor-thin until a new policy context is evolved.